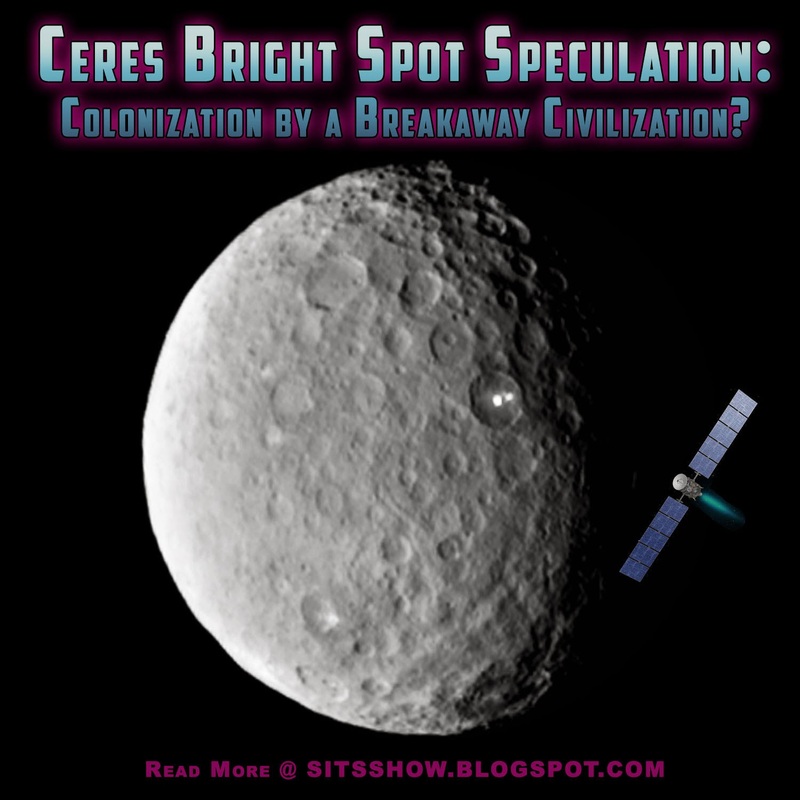 Ceres Bright Spot | Colonization of Ceres by a Breakaway Civilization? The following article details some interesting data points regarding the Bright Spot captured by NASA imaging on Ceres. Whether or not the speculations offered are valid remains to be seen. When NASA’s Dawn ion propulsion spacecraft approached Ceres and began relaying back photos clearer than any seen to date, astronomers were surprised to find two bright spots within a crater on its surface. The suggested explanation is that these spots are either surface ice or a whitish salt deposit. So they are anxious to have a closer look when Ceres makes its close encounter in a few weeks and begins taking close up photos of its surface. I don’t buy the given explanations for several reasons. • First, the spots are brighter than the illumination of the day side. Ice or salt would not do this. This might be possible in the above photo if there were surfaces oriented at 45° angle to the Sun reflecting sunlight toward the spacecraft. But look at the next photo below. The spots stay illuminated even at sunset. If it were ice, sunlight should be reflecting at low angle from the surface; not toward the spacecraft. 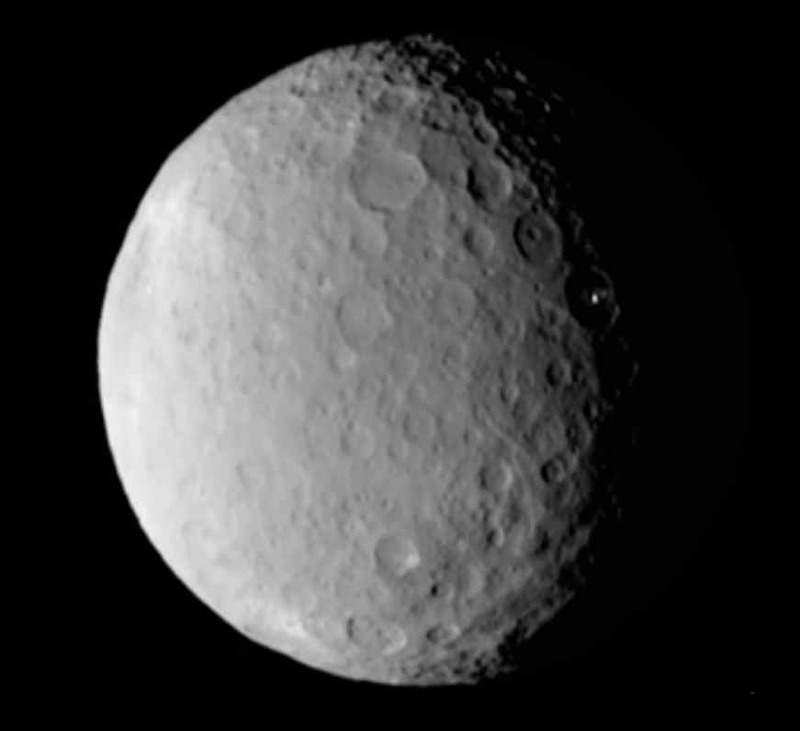 Now look at the photo below that where Ceres has rotated a bit more. The spots are at the terminator shadow and still illuminated. Now check out the image below that. The spots are now on the night side of the terminator and we still see them illuminated. They are not as bright as in the first photo because now we are seeing them at a low angle. Light reflecting off of ice or salt does not do this. • Second, if this is natural it is strange that two bright spots would be found in the same crater. It is also unusual that one would be in the crater’s center and the second would be displaced from the first in a direction parallel to the planet’s equator. City planners do this sort of thing, not Nature. 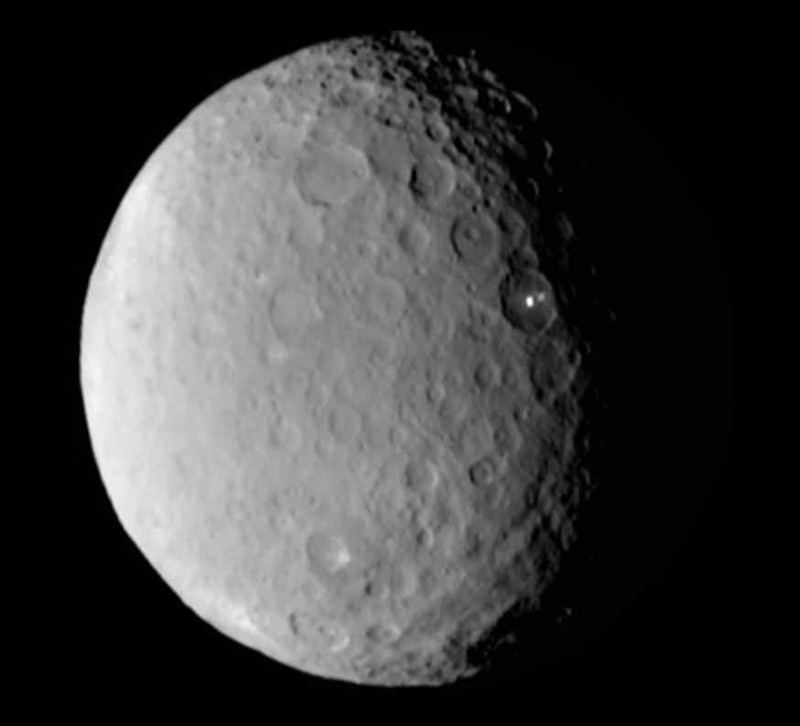 Given that Ceres is 950 km in diameter, these luminous spots appear to be about 10 to 15 km in diameter. This is about the size of a city and cities are normally illuminated. Ceres would be an ideal place for a spaceport base whether it be an alien civilization or built by a breakaway terrestrial civilization. Since Ceres rotates once every 9 hours, perhaps its residents feel that it makes sense to keep their city illuminated throughout Ceres’ rotation cycle rather than turning its lights on and off. Besides at 2.77 AU from the Sun, even at mid day, Ceres surface would be receiving an illumination of only 13% of what the Earth receives, hence about what we earthlings would be getting at dusk. 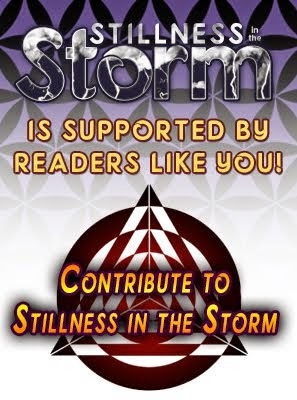 a) There is a civilization there and their existence will not want to be known by Earth media. So they will disable the spacecraft. Namely it will cease transmitting signals to Earth before it goes into a close orbit. b) The shadow government will not want the existence of this deep space base known; so they will cause NASA to stop the visual feed and claim some problem occurred with the spacecraft. c) The shadow government will decide this is a good time for disclosure and will level with everyone that this is one of our space bases, that we have been doing interplanetary space travel for decades with advanced propulsion technologies not used by NASA; or in the case that this is an alien ET base, they will decide this is a good time as any to disclose about the alien presence on Earth and in our solar system. d) The camera shots being shown are not showing just visible light but also infrared light and there is some peculiar feature of the surface that allows it to strongly radiate infrared radiation. 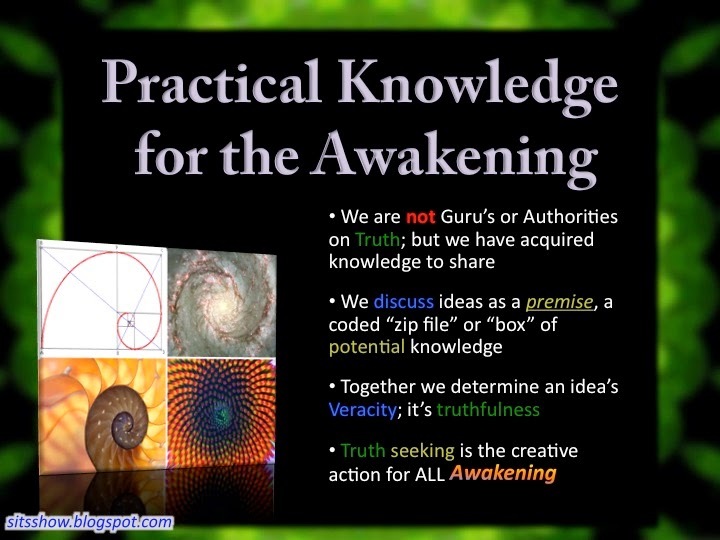 But this does not explain the geometric alignment of the “bright spots”. Personally, I feel that either (a) or (b) will happen. I don’t want to be pessimistic, but this sort of thing has happened before; e.g., with the Russian spacecraft that got disabled by a laser beam during its approach to the monolith on Mars’ moon Phobos. More on that here. So let’s wait and see. This may turn out to be another Malaysian airlines scenario. 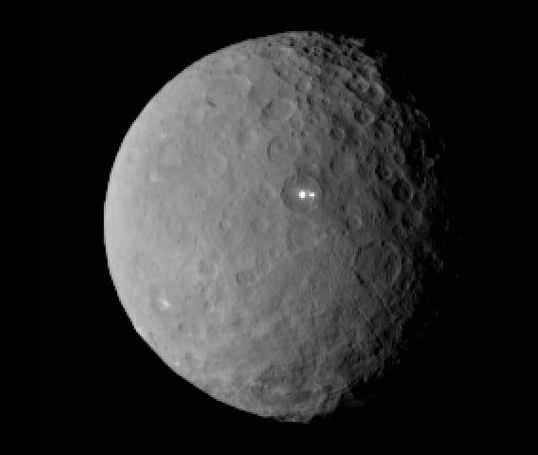 According to Dawn's schedule that probe was supposed to have already been in orbit around Ceres by March 6th. 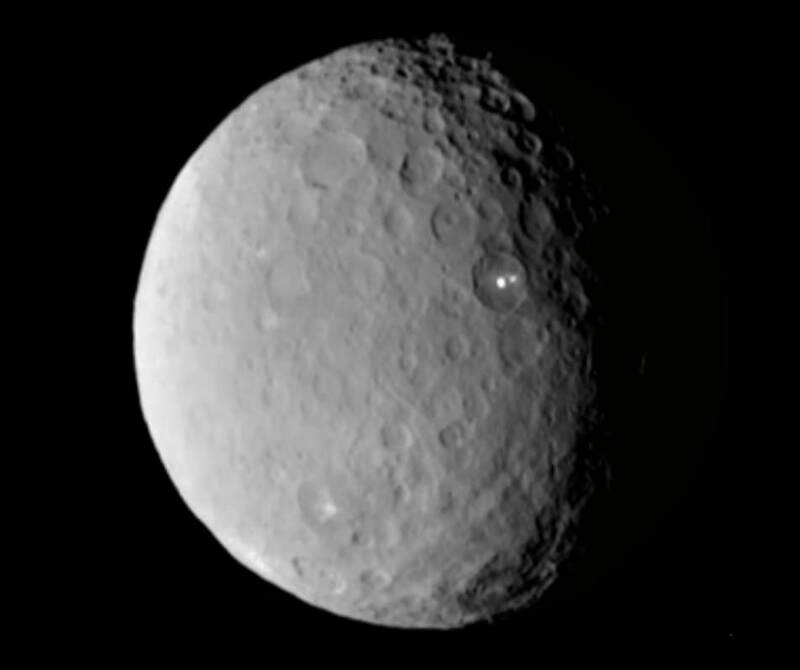 It is now March 9th and yet no further information of Ceres or these bright spots have come forth by NASA. NASA has never been anything close to transparent or truthful so I also suspect that NASA will cover up any anomalies they encounter with Ceres.